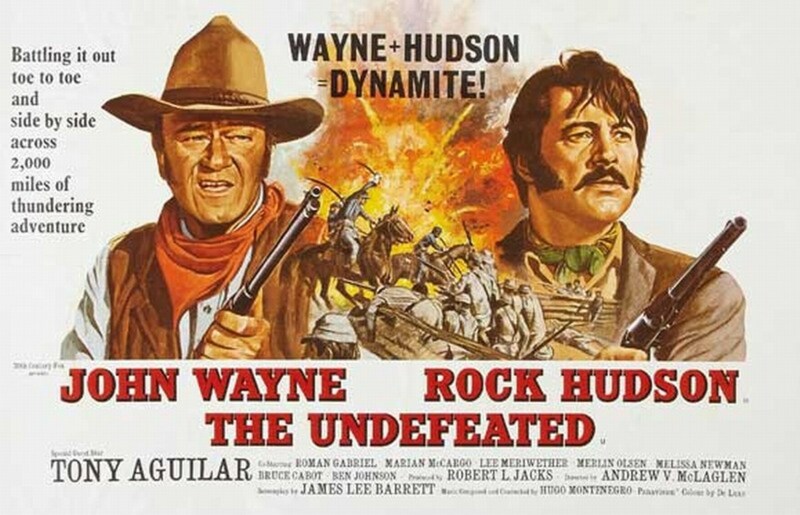 As the Civil War draws to a close, John Wayne plays John Henry Thomas, a Yankee colonel who wants to remove his battle-weary men from the military and earn them some money to retire on by rounding up and selling thousands of horses. On their way to Mexico to make the sale they encounter rogue Confederate Colonel James Langdon (Rock Hudson) who continues to lead a band of men and their families displaced by the war. As with Gone With the Wind, I’m aghast at Hollywood’s sympathetic portrayal of the Confederacy and the Old South. I’m all for tolerance and understanding, and I think nuance is generally a good thing, even when showing people generally considered to be the bad guys, especially in films set in the real world. But if you contrast the portrayal of the Confederates, people who were prepared to fight and die for their right to own slaves, with other villains of history, such as Nazis or Communists, the difference is striking. While those groups are shown in the most black and white, good and evil terms, the simple fact of the Confederates being American means they’re viewed vastly more positively. In The Undefeated they’re shown as decent, honourable men who happen to disagree with their Northern counterparts on a couple of things, but are all quintessentially American, and as such, good. Can you imagine a mainstream film in which American forces in Europe in 1945 befriend a group of Nazis, help them out, go to efforts to protect their lives and discover they’re not so bad after all? It seems unlikely. From realistic war films like Fury to cheesy action like Indiana Jones and Inglourious Basterds, Nazis are basically treated as disposable villains to be killed in action scenes. Until some middle ground can be found between these extremes, the contrast will continue to be an uncomfortable one, showing a USA-centric world-view in which people who happen to be from that country are automatically better than anyone else, regardless of their actions. 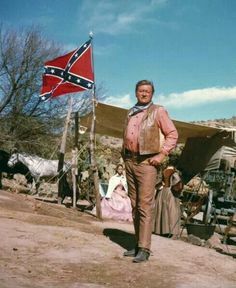 It’s unsurprising with this kind of attitude so accepted in mainstream films (at least as recently as the 60s) that people, and even government buildings, see it fit to fly the Confederate flag today. In other senses this is a good action film, with plenty of excitement and a reasonably interesting plot. This is the first John Wayne film I’ve seen, and he certainly isn’t as charismatic as I expected given his legendary status, especially when I recently watched a film by the similarly iconic Errol Flynn who lives up to every inch of his reputation. This is a solid if unexceptional Western that’s exciting enough to make up for its negligence of any moral issues.